In April 2015, the Center for Agricultural and Rural Development (CARD) published the sixth annual top 10 Chinese tea brand names report. The study aims to measure ‘brand value’ of commonly used tea names that are attached to a certain production region. These results are taken seriously by Chinese tea professional in China as CARD’s results has become a barometer for the nation’s tea industry. Before we start, we would like to show an example of what we mean by a regional tea name. For example ‘Dragon Well’ is a commonly used brand name by farmers for most green teas from the West Lake region. This years results are spectacular with Anxi’s Tie Guan Yin leading the top 10, while the all time favorite Long Jing (also known as ‘Dragon Well’ tea) from the West Lake lost its first position. The above table shows that the top 4 teas strongly leading the list (Tieguanyin, West Lake Longjing, Xinyang Maojian, Yunnan Puerh) maintain their strong leading positions over the other 6 teas. Biluochun not in top 10? While you’ll find the Dongting Biluochun almost in any top 10 Chinese tea list online, it surprising dropped out of this year’s top 10. Last year this green tea was still on the 5th position. 2014’s CARD report was a disappointing one for Dahongpao farmers as this popular oolong tea ended on the 11th position, just outside the top 10. This year, farmers in Wuyishan can celebrate a comeback as it enters the top list again on the 9th position. Even though West Lake Longjing has lost it’s first position, it didn’t have a bad year with an amazing 10.3% increase. One possible reason for not maintaining its first position is that alternative Longjing teas from other regions are gaining popularity, such as Dafo’s Longjing tea. This alternative longjing tea climbed from last year’s 7th position to the 6th position this year. Not strange, given that a decent West Lake Longjing tea is hard to find for reasonable price these days, if you don’t buy it direct from the source. 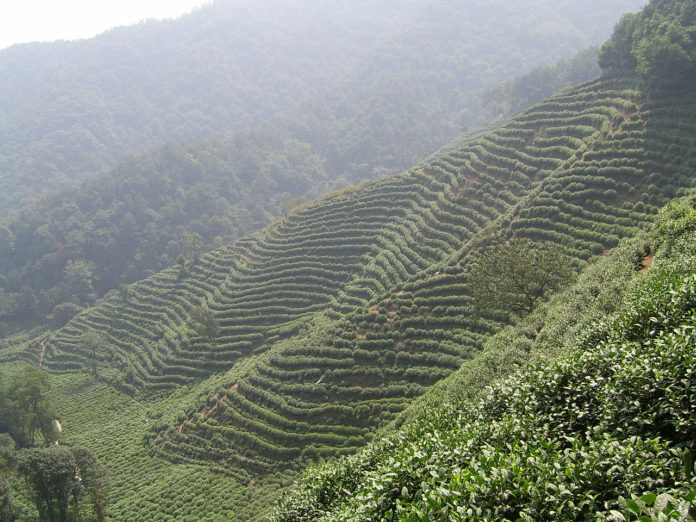 Dafo Longjing’s success is definitely an inspiration for less well known tea regions in China. 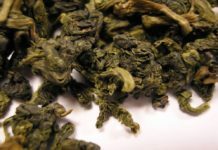 In addition, processing green tea is relatively easy compared to oolong teas, such as Tieguanyin. The partial fermentation of oolong is a skill that comes with experience, which his hard to reproduce easily in other regions. On the other hand, green tea processing doesn’t have the fermentation step. As long as farmers of alternative regions are able to grow high quality raw leaves, the processing part can be mastered within a reasonable amount of time. When adding up the brand value of all 203 tea name included in the research together, the total number is 126.8 billion yuan of value, an increase of 11.4 billion yuan (or almost 10%) increase compared to last year. While absolute numbers might not say much, the % increase is remarkable, indicating that the Chinese tea market is growing significantly. This trend is directly related to a growing middle class in China. There are several opinions of the best Chinese teas, or the title China’s Famous Teas (中国名茶) or Ten Great Chinese Teas (中国十大名茶), depending on current trends in Chinese tea, as well as the region and tastes of the person. Different sources cite different teas, but the following table compiles ten different such lists and ranks the teas upon recurrence. Previous articleWhat does China have against Peppa Pig?